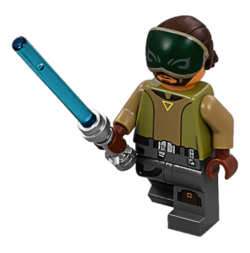 Kanan Jarrus is a Star Wars Rebels-themed minifigure first released in 2014. Caleb Dume was a Jedi apprenticed to Master Depa Billaba when Palpatine initiated Order 66. 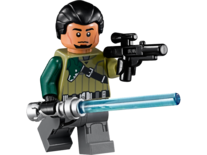 Clone Troopers opened fire on the Master and Apprentice, however, while Billaba fell, Caleb managed to escape and took on the new identity of Kanan Jarrus. Initially keeping a low profile as a freighter pilot, Kanan eventually met Hera Syndulla, and with her, they started to form a small group of rebels who made raids on Imperial forces, stealing their weapons and supplies. Some time into their operation, the rebels met the Force-sensitive Ezra Bridger, and Kanan, after revealing himself to be a Jedi when he switched his blaster for a lightsaber to defend against Imperial forces, took Ezra to be his apprentice and began to teach him the ways of the Force. Kanan Jarrus in LEGO Star Wars: The Force Awakens. This page was last edited on 11 December 2016, at 01:54.